Interior plant guarantee. All plants must thrive. Interiorscape service is an important and effective part of the modern efficient work environment and is proven to increase work morale and productivity. Our interior lanscaping program features the use of tropical plants, flowers and containers. 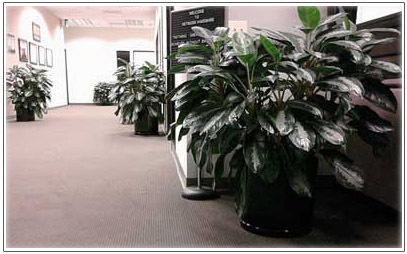 Plantman.com Interiorscape helps enhance your office environment, from individual office spaces to office atriums and complexes. We can start up with as many plants as you want, then add or subtract as you like. Leasing plants is completely flexible and affordable. The base rate for lease/ maintenance is $65, then $10/mo for large (5'+) plants, $7.50 for mid sized (3'-5') and $5 for smaller plants. It is best to design a plantscape based on the interior and traffic of the office as well as individual desires. Usually, an office will have mixed sizes, some tall and some small. A roughly 4,000 sq foot office will use about 10-15 plants, with the lease rate typically ranging from $140-$250 per month including guaranteed maintenance. With 20 years experience we emphasize proper plantscape design. We set up the plants with not only beauty and subtle style but practicable and efficient maintenance in mind. We take pride in our plantscapes and our value. We use high quality, heavy ceramic containers up to 24" in diameter with matching glazed under-saucers and invisible feet to avoid carpet crush under the large floor plants while providing safety and weight to the tall trees. There is no extra charge for replacements or changes and additions; just a small one-time installation/delivery fee that is equivalent to the monthly rate. I look forward to hearing from you about your ideas. Qualified horticultural technicians help us ensure a continually appealing work environment by providing all your plant maintenance needs. We offer a less intrusive, more economical maintenance model with our proven failsafe maintenance systems. Efficient, time-tested biweekly maintenance will work for 90% of all interiorscapes. We guarantee it. If any plant declines we promptly replace it. We our proud to offer beautiful, flexible and affordable commercial plant leasing, and I am happy to explain our rental rates to you. With a base rate of $65 each additional plant is $10. Ten plants would be $165 per month. All plants are guaranteed to have a thriving, beautiful appearance. Plants will be selected for the cultural and aesthetic "fit" to office ergonomics, lighting and decor. One-time startup/installation fee equals one month rental rate. An equal quantity of tall (over 5') and short (under 5') will be incorporated into the plantscape. All plants come with beautiful gloss black ceramic containers and invisible protective risers and internal catch trays. Plant maintenance—watering, feeding, cleaning, leaf dusting, container cleaning, pest management and plant replacement at no extra charge—will ensure beautiful and thriving plants. We'll help you create a beautiful atmosphere and ambience for your home or office – inside or outside. Flexible and affordable. Minimal start-up fee for design and installation. Month-to-month terms. Add a plant, replace a plant, move a plant, or subtract a plant. This program offers a commercial short-term rental program for special functions and occasions, with a full array of tropical and seasonal trees and flowers, with arrival and setup of your special request done quickly and efficiently on the requested date. Our Event Rentals sections provides more information on this program. Our Plant Maintenance Guarantee provides more information on our guarantee.